Similar in scope to HIV and STD Prevention outreach, anti-tobacco initiatives have found success over the years in targeting the LGBT community online via both websites & mobile users on apps including Grindr, Scruff, Growlr, Jack'd and Hornet. Most campaigns are geo-targeted, and are designed to drive both awareness of and traffic to anti-tobacco initiatives in their area. We have been servicing a growing number of these ad campaigns, with each one being geo-targeted to specific parts of the US. The primary benefit to working with our company is that we are a one-stop shop for reaching the LGBT community on most of the LGBT websites online, as well as ALL of the top gay dating apps, not just a few. Utilizing programmatic ad technology, we are able to target your campaign to just the regions you need to help get the word out. With the advent of programmatic ad targeting in the LGBT community, this community can now be more easily reached than ever before. Utilizing Oracle BlueKai's powerful Audience Data Marketplace, as well as other data sources including Datanics, Lotame, Epsilon, Nielsen, Dun & Bradstreet and Experian, we now have the ability to deliver a connection between a "real world" audience and that same audience using the Internet. 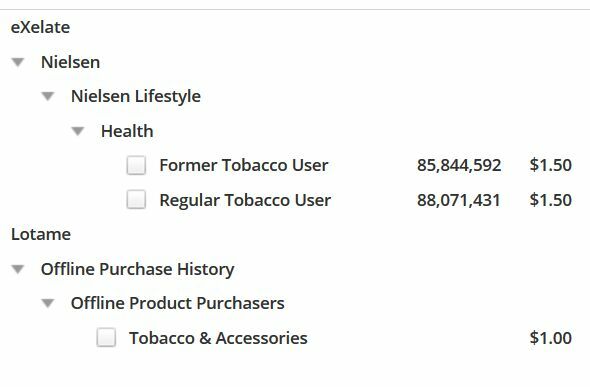 As shown in this example, we can target both former and current tobacco users, as well as those purchasing tobacco-related products. For more detailed information on this marketing program and strategy, Click Here. For more detailed information on this marketing program and strategy, in blog format, Click Here.